I'm a geek, and I'm a golfer. 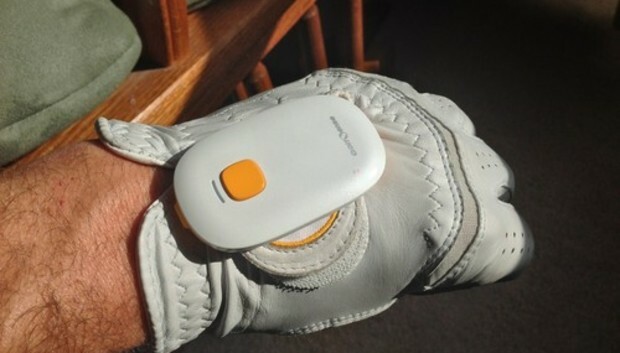 As such, the $130 GolfSense Glove-Based Sensor system seems like a gadget designed just for me. The Sensor itself is a small, very light (17-gram) device that attaches to your golf glove and works with an iOS or Android app to help improve your golf game. Specifically, the Sensor stores swing data, and then communicates that data with the app for analysis. You interact with the app to study the recorded data and (in theory) figure out why your golf ball isn't going where you want it to go. The Sensor attaches to your glove using two rubber straps on the back of the sensor, which slide over the velcro closure found on (most) golf gloves. The Sensor is amazingly light: Whether I was hitting balls at the range, playing a round of golf, or just swinging a club in the backyard, I didn't even notice the device was on my hand. It's also small enough that it doesn't interfere with any hand motions. On the other hand, while I never had any issues with the Sensor falling off during a swing, the way it attaches does make it much less convenient to remove your glove, say, when putting--remove the glove the wrong way, and the sensor falls to the ground. Also, the rubber straps feel like they may stretch over time, leading to a less secure attachment, but I had no problems during my two weeks with the device. Finally, closing the velcro on my glove was a bit trickier with the sensor in place, as there's not much free material to grab and pull. A USB-based charging station keeps the Sensor ready to go when you're not using it. I found the app side of GolfSense to be well designed, intuitive, and loaded with features that should appeal to golf geeks everywhere. The main screen features four tabs (Home, History, Account, and More), as well as on-screen instructions for pairing and using the sensor, if needed. Once you've recorded your golfing, the app lets you view any recorded swing. When doing so, you can watch a replay, dig into the stats, or just use the overview to get a sense for what was good and bad about that particular swing. In general, the sync feature also worked well. The only trouble I had was that I couldn't get the app to sync my golf club setup across devices--I wound up doing this by hand on each device. According to the company, this data should sync, but we were unable to figure out why mine did not. GolfSense is first and foremost a training aid, rather than something to use during an actual round of golf--you'll want to use it either while at the driving range or while taking practice swings in the backyard. I'm pretty sure use during a competitive round would be very much against the rules, but since I don't play competitive golf, I went ahead and gave that a try, too. When used for practice, GolfSense works great. Before swinging, you simply pause in address (ready-to-hit-the-ball) position for a second to prepare the sensor. Then you take your normal swing, and the GolfSense sensor automatically records your swing data. There's even an option in the program to ignore swings that don't result in ground/ball contact, so that you can take practice swings that don't get recorded. Prior to each swing, you tell GolfSense which club you're swinging by tapping a pop-up menu on the main screen. When used on the practice range, this feature worked fine in my testing. When I tried to use the device while actually playing, though, this screen would occasionally become non-responsive, forcing me to quit the app and relaunch it. A recent software update helped that issue, though it didn't completely eliminate it. The other problem I had using the device while actually playing a round was battery life. The sensor itself was fine, but over the course of nine holes of golf, my iPhone 5's battery drained down to just over 30 percent of a full charge. Again, this wasn't an issue during practice swings (unless, of course, you routinely have two-hour-plus practice sessions), but if you intend to use the GolfSense system for many hours in a row, I suggest investing in an iPhone battery case. So what does GolfSense record? A ton of data, including swing plane, clubhead speed, hand speed, swing tempo, backswing position, back and down swing comparison, wrist release, estimated distance, and even (if you keep your phone in your pocket) hip rotation. Just how good is that data, though? The answer varies depending on which data you're looking at. I compared the GolfSense system with a high-end radar-based tracking system at the driving range, and I found that the GolfSense does a great job at tracking swing plane, swing tempo, and club position. Its visuals were also exactly what I expected based on how I felt I'd swung the club. As an example, I made an intentionally-hideous over-the-top swing, and the recorded track (see image at right) matched exactly how the swing felt. In other areas, the GolfSense gives good general guidance, but the specific values may not be spot on. For instance, I found clubhead speed and distance to be lower than with the radar-based system, although the measures were at least consistently lower. The hip-rotation feature is interesting, but I had issues with the reliability of the data. GolfSense measures hip rotation using the motion sensors in your smartphone: You keep the phone in a front or back pocket while you swing, and GolfSense interprets the motion to come up with a hip-rotation value. In theory, this is a great idea, as it's something that not even the expensive systems can do. However, in practice, I would get results that were all over the board, even when making near-identical swings with my most consistent club. In talking with the company, I was told to use a front pocket if possible, and that looser pants result in less-consistent results. Is the GolfSense system perfect? Of course not. It's a $130 device that can't compete with the multi-thousand-dollar radar-based systems you'll find at many driving ranges. On the other hand, that $130 gives you useful and actionable data--my recorded swing-plane data shows that my hands have a tendency to come up and over at the top of the backswing. Having a device on hand (literally) to help me cure that issue at the practice range is a wonderful tool. Will it improve my game? Only time will tell, but so far, I like what it's done for my understanding of my golf swing.